During my visit to Ennis, Co Clare yesterday [1 August 2018], I was shown around Saint Columba’s Church, Drumcliffe, the Church of Ireland parish church, by Canon Bob Hanna, who retired later this month as Rector of the Drumcliffe Group of Parishes and as Canon Chancellor of the three cathedrals in the diocese, Limerick, Killaloe and Clonfert. Bob and I have been friends for many years, and he invited me to preach at his Harvest Thanksgiving Service many years. 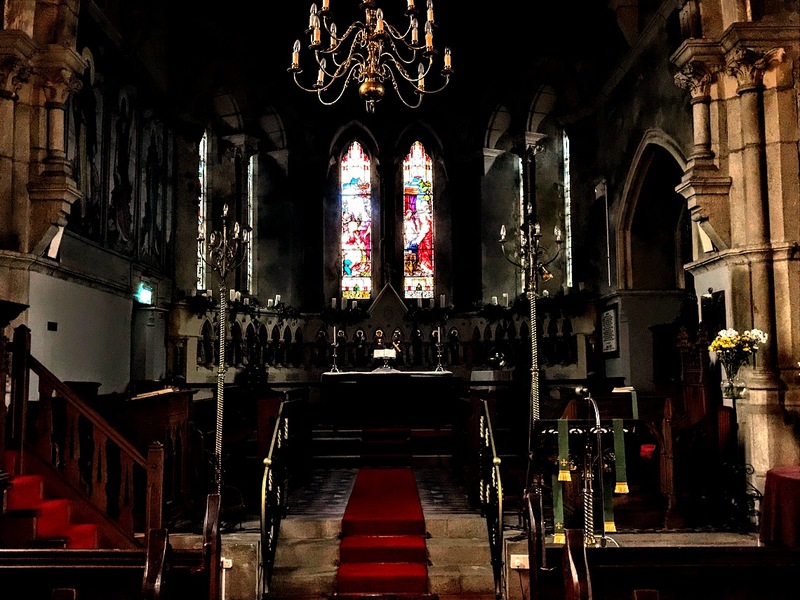 So it was interesting to reacquaint myself with this beautiful parish church close to the town centre of Ennis and the banks of the River Fergus. The Church of Ireland parish in Ennis retains the ancient parish name of Drumcliffe, and is a small parish within the Diocese of Killaloe in the Church of Ireland. 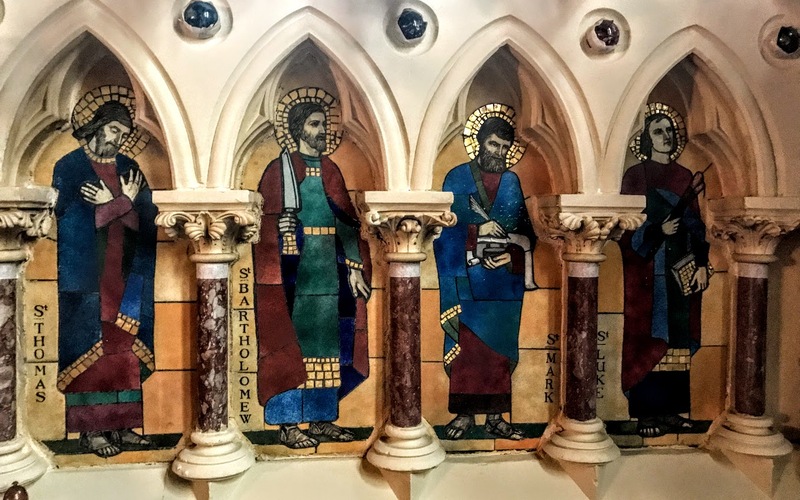 It is an historical curiosity as the last Anglican church built in Ireland before the Disestablishment of the Church of Ireland under the Irish Church Act 1869, but is also interesting because of the reredos which is the work of the artist Catherine O’Brien. Drumcliffe Union covers a vast area from Shannon Airport in south Co Clare to Galway Bay in north Clare and Kilkee and Spanish Point in west, taking in the Burren plateau and including Saint Fachan’s Cathedral Church, Kilfenora, with its Celtic high crosses. The two parish groupings, Kilnasoolagh and Drumcliffe, sit amid a network of historical and church sites and within a European Conservation Area that boasts breath-taking Atlantic coastal scenery. Saint Columba’s Church was built between 1868 and 1871 as the new church for Drumcliffe Parish. Until then, the main Church of Ireland parish in Ennis had been located in the nave of the former Franciscan Friary church. Drumcliffe was located off the Gort road, where the public graveyard is still located. Drumcliffe Church on Bindon Street stands on the site of an earlier Saint Columba’s Church renovated by the Limerick-based architect James Pain and rebuilt according to plans for the Chapel Royal in Dublin Castle. The old church had been struck by lightning, and the new church was built in 1817-1818. Bindon Street was planned by Captain Charles Hervey Bagot (1788-1880) and takes its name from the Bindon family who lived in Springfield House into the 19th century. 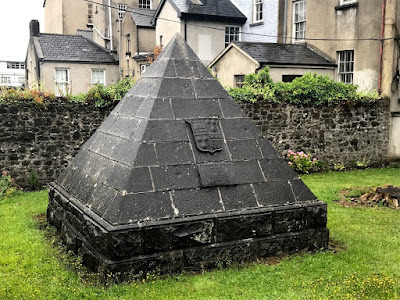 They included David Bindon, MP for Ennis, who died in 1735, and his son Francis Bindon (1695-1765), MP for Ennis, portrait painter and one of the architects who pioneered Palladian-style architecture in Ireland. The Ecclesiastical Commissioners approved building a new church in 1860-1864, and the church was designed by Lanyon, Lynn and Lanyon in 1868. The foundation stone was laid on 24 June 1869, and the church was consecrated on 30 November 1871. The architectural partnership of Lanyon, Lynn and Lanyon was based in Belfast and Dublin. It was formed in 1860, when Sir Charles Lanyon (1813-1889) and William Henry Lynn (1829-1915) took on Charles Lanyon’s eldest son, John Lanyon (1839-1900), as their junior partner. At the same time, the firm opened a branch office at 64 Upper Sackville Street, Dublin, which was run by John Lanyon until 1867. 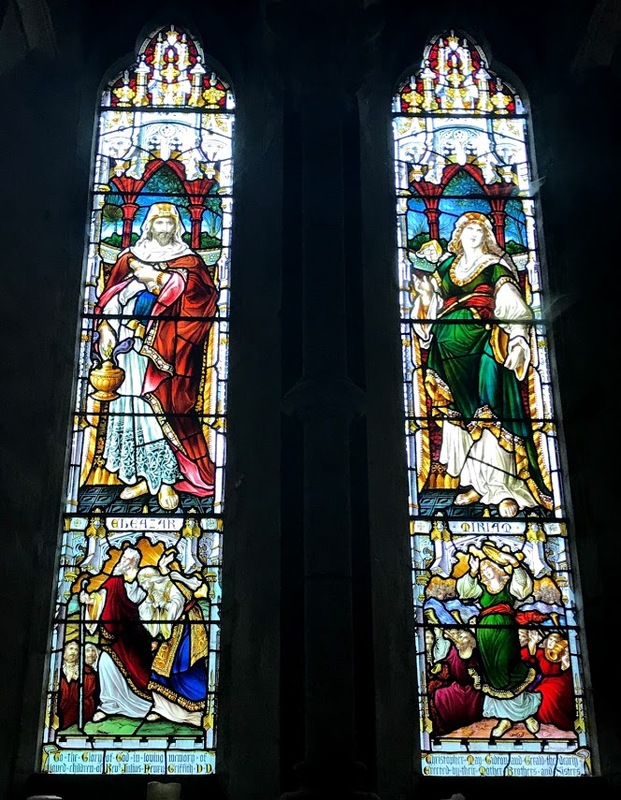 Their other works at this time included Saint Mary’s Cathedral, Tuam, Co Galway, the Unitarian Church on Saint Stephen’s Green, Dublin, and Newtownbarry House, Bunclody, Co Wexford. The partnership was dissolved on 1 July 1872, half a year after the church in Ennis opened. 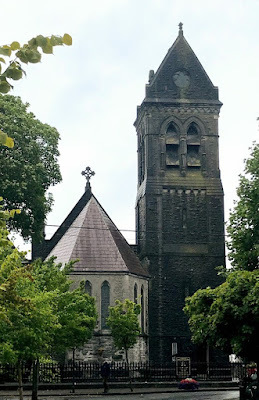 The present Saint Columba’s Church was the vision of Canon Philip Dwyer (1822-1905), the author of several books on local history and church history. He was the Rector of Drumcliffe from 1864 to 1883. His descendants say he later moved with his family to British Columbia in Canada, disappointed that he had not been elected Bishop of Killaloe. He later moved to England and died in Weston-super-Mare in 1905. Saint Columba’s Church has been described variously as ‘Decorated Victorian’ or ‘Gothic Revival,’ and it presents a high standard of Victorian craftsmanship. It includes some unusual features such as a Celtic cross and Round Tower that shapes the chimney flue in the roof. 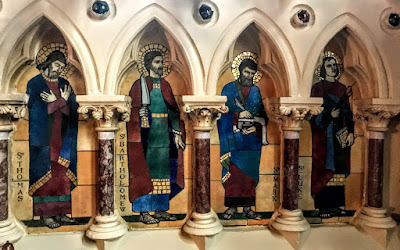 The most interesting feature in the church must be the James Leech reredos, containing 24 ceramic biblical figures by Catherine Amelia O’Brien (1881-1963). The reredos was donated by James Leech as a memorial to members of his family and various rectors and parishioners of Drumcliffe. It has 24 arches supported by marble columns of varying colours, into which Catherine O’Brien’s mosaics are set. She studied at the Mercy Convent, Ennis, before going on to the Dublin Metropolitan School of Art, where she studied under William Orpen and Alfred E Child. She was a founding member of An Túr Gloine in 1925 with Ethel Rhind, Evie Hone, and Michael Healy. 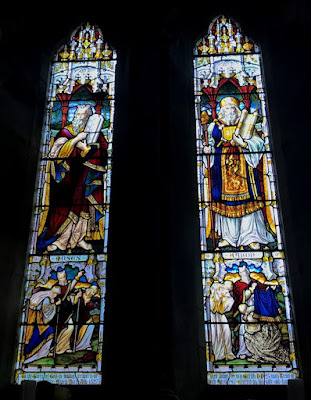 Her work includes the window depicting Saint Patrick in Saint Edan’s Cathedral, Ferns Co Wexford, three windows in the Honan Chapel in University College Cork, two stained glass windows in Holy Trinity Church, Rathkeale, Co Limerick, two pairs of lancet windows in Saint Mary’s Cathedral, Limerick, commemorating Dean Lucius O’Brien and the Revd James Dowd. One of her last commissions was a pair of windows for the President’s private chapel in Aras an Uachtarain. She was involved in the life of Christ Church Cathedral, Dublin, for 40 years, and when she died in 1963 she was buried in Whitechurch churchyard, Co Dublin. 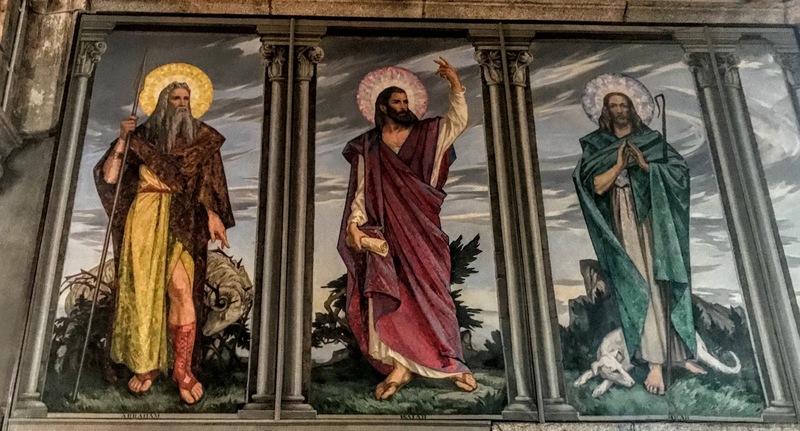 From 1937 to 1947, Catherine O’Brien worked on the 24 opus sectile panels in the church in Ennis. 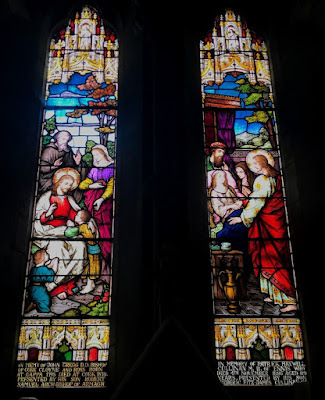 The central windows in the apse were erected by Robert Samuel Gregg, former Archbishop of Armagh, in memory of his father, John Gregg (1798-1878), former Bishop of Cork, Cloyne and Ross, and by Frederic FitzJames Cullinan in memory of his father, Dr Patrick Maxwell Cullinan of Ennis. 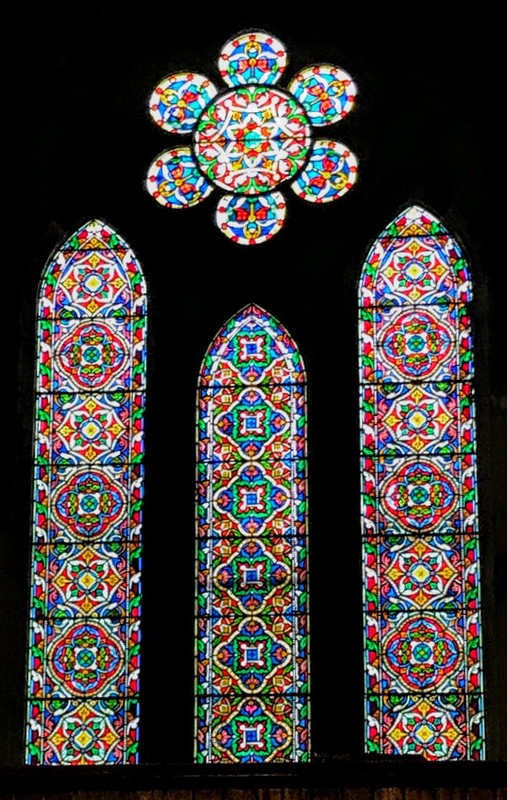 The north and south windows in the chancel, by Jones and Wilson, the Birmingham-based partnership, are memorials to a former rector, Julius Henry Griffith, and four of his children. He was the Rector of Ennis and Clare Abbey for 25 years and died in 1907 aged 80. These windows feature Moses, Aaron, Eleazar and Miriam. Three large figures on canvas in the chancel depict Abraham, Isaiah and Micah. They were painted in memory of Florence O’Brien by the artist Brigid (O’Brien) Ganley (1909-2002), a daughter of Dermod O’Brien of Cahermoyle House, Co Limerick, a former president of the Royal Hibernian Academy. 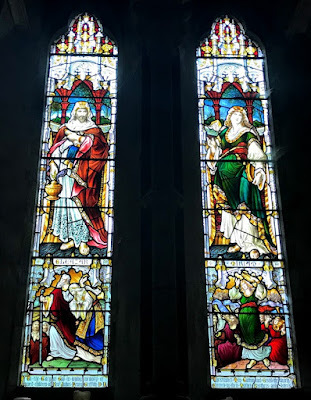 The stained-glass windows in the church include a memorial to three sisters Henrietta, Norah and Beatrice O’Brien, a window with four biblical scenes dedicated to Thomas JP, and a ‘Good Samaritan’ window in the north nave dedicated to James Menzies, for 50 years a bank manager in Ennis, who died in 1880. 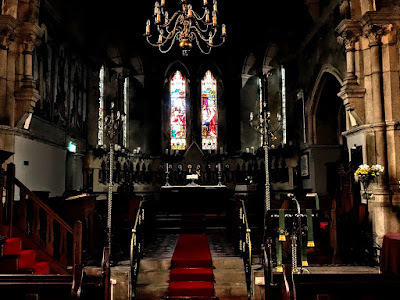 The carved chair and reading desk in the South Chancel came as a gift when the Presbyterian Church in Ennis was closed. The choir stalls were donated by local officers and soldiers from World War I in memory of those who died in the war. The Bindon family married into the Blood family, descended from Thomas Blood, who tried to steal the Crown Jewels in 1671. A large stained-glass window in the church commemorates Bindon Blood who died in 1855 at the age of 80. Memorials in the churchyard include a small pyramidal mausoleum to the Blood family and a wooden grave cross from Ypres, a reminder of World War I (1914-1918). ● Sunday services in Drumcliffe are at 11.30 am, alternating between Morning Prayer and Holy Communion.